Ollami is marketplace that puts travelers in direct contact with local Destination Management Companies (DMCs). Just as Airbnb connects travelers with flat owners, we believe it is time to connect travelers to DMCs to create a win-win tourist connection. 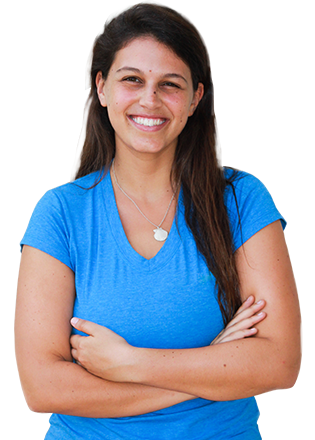 We are a group of entrepreneurs with years of experience in travel and technology. Our team of experts specializes in nature, culture and adventure tourism worldwide. We put leading technology, cutting-edge tools and our expertise at the service of customers worldwide. We would like to bring your trips to more people. Moeen, Sanjeev, Lucas, Amit and many more have already joined Ollami. We would like you to join too! ARP Travel Group offers more than 70 years of expertise throughout East Africa with planning a single destination safari or a pan-African experience of a lifetime. Creating happy travelers – Yatra Ecotice Routes offers unique experiences of India Bhutan, Nepal and Sri Lanka. Offering unique experiences since 2002, Tangol specializes in providing tours and accommodation throughout the vast Argentine territory. The Tangol Team will make your trip to Argentina an unforgettable journey. Hayleys Tours, one of the premier DMCs in Sri Lanka represents a number of reputed agencies across the globe. With 25 years of experience, Amith makes sure that every guest enjoys the best of Sri Lanka. Our customers are looking for the best travel experience. They search the many destinations offered by the Ollami DMC network partners. Customers choose your travel package, want more information about it and to customize it to their more specific needs. Customers communicate with you directly via our innovative online platform. You have the knowledge to personalize the trip according to their needs much better than travel resellers. Customers gain a better travel experience with less middle-people, you get more sales and improved customer satisfaction, and we get our referral fee. Direct contact between travelers and DMCs results in increased closing rates, better service and improved customer satisfaction. Ollami site visitors are referred to you directly. Lower prices for customers, more bookings for DMCs. We get our fee only on closed deals. Innovative technology, highest standards of marketing, language, product quality, response time and service. Ollami is always here to help each and every customer – both travelers and DMCs. Ollami ensures secure payment, insurance and 24x7 support. Easy-to-use interface puts more destinations at the fingertips of travelers and exposes you and your trips to more customers. 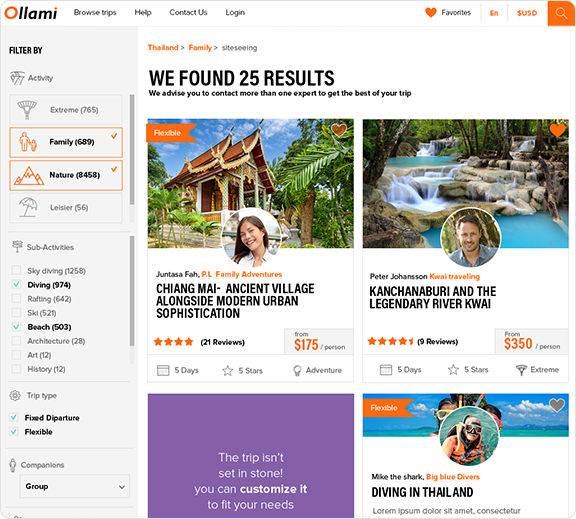 Use the Ollami marketplace to offer your local trips to a global audience. Take advantage of the direct connection to customize their trip to their specific needs – you know better than any reseller what to offer them. Ollami does all the work. All you need to do is be there, answer the customers’ questions and close deals! Let us help us increase your sales! It’s entirely up to you. Each country has different types and lengths of trips, and you know them better than us. There is no minimum. It depends on your most popular packages. We will not deal with daily tours. The company’s headquarters and customer service are located in Berlin, Germany. The development team is in Tel Aviv, Israel. Our company includes travel, technology and marketing professionals. 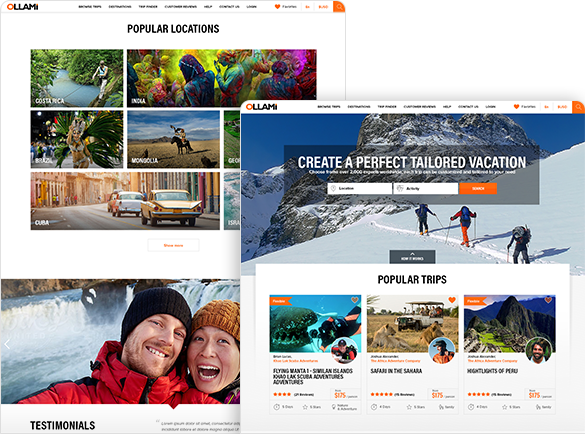 Our travel and tourism founders have been involved in nature, culture and adventure trips for the last 30 years, our technology team is at the cutting edge of web and mobile development and our digital marketing team is a leading team worldwide. The Ollami platform is being launched in Q4 of 2016. But we have been leaders in the nature, cultural and adventure trips sector for over 30 years, with expertise in many destinations worldwide and a substantial customer base. You will upload your trips to the website. It is a simple, quick process and you’ll get the full support of our team. This will also give you the freedom to add and edit as many trips as you want when you want. We charge for the trip and transfer the payment to you minus our commission. Travelers will pay when they order and again close to the trip date. You will receive the last payment at least 10 days before arrival. How much do I have to pay to join? How much is the commission charged? You don’t have to pay anything to join. Our commission is 10%. The customer views the price you entered on the site, so you should include the 10% commission in your price quotes. Together with our partners, we have a huge customer base around the world. We also plan to engage in aggressive digital marketing with key market leaders (our development center is in Tel Aviv, the leading digital marketing capital of the world). Will you host other DMCs from my country on your platform? If so, how many? Who are they? Depends on the country’s size. We will invite several DMCs our customers would enjoy the diversity of trips in your country. Can you display my products first in the search results? How is this done? 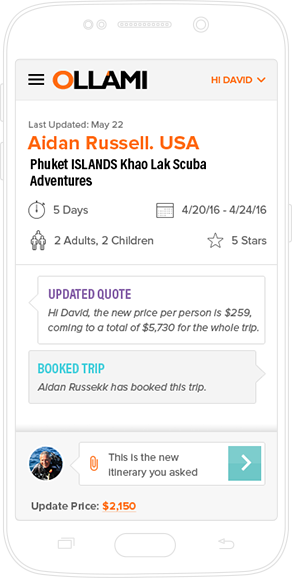 Trips are filtered according to customers search and the rating they receive. The more they match a search and the highest the rating, the more customers will be exposed to them. Don’t forget to Send us many reviews from B2B and B2C customers to improve your rating and ranking!. Nature, culture and adventure trip consumers from around the world, with special emphasis on families and VIPs. We will market mostly at United States, Canada, Western Europe and Russia. We have a dedicated area for groups and group leaders. There is no limitation. We recommend uploading your most popular trips. The more you upload and the more popular the product, the highest your exposure and, obviously, your sales. There is no minimum number of trips that can be uploaded. At this stage, the site supports English. It is expected that by June 2018 the platform will support French, German, Russian, Spanish and Italian.